I made these doughnuts (my first ever; don’t know what I was waiting for) for Tartelette and Peabody’s Time to Make the Doughnuts event. They allowed baked doughnuts, although they warned against making a habit of it. Still reeling from holiday fat overload, I couldn’t bring myself to deep fry anything right now. Next time. These were inspired by Heidi’s Baked Dougnuts at 101 Cookbooks, and my recipe loosely based on hers. I experimented with different sugar/spice mixtures for the coating, in which the doughnuts are dipped after baking. My favorites were 50/50 brown sugar and granulated sugar with cinnamon (pictured above), and granulated sugar with cardamom. Another interesting one was granulated sugar with chipotle powder. The possibilities are limitless. Combine flours, milk powder, water, eggs, 30 g butter, yeast, and salt in the bowl of a stand mixer. Mix in low speed to incorporate the ingredients, about 4 minutes. The dough will still seem fairly stiff at this point. While continuing to mix in medium speed, add the 150 g of sugar in five or six increments, mixing for a minute or two between additions. Continue to mix until the dough reaches almost full development. 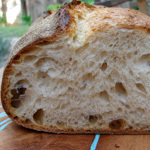 Ferment the dough in a lightly-oiled container at room temperature (about 70F) for 1.25 hours. Turn the dough out onto a lightly-floured counter and roll it into a 1/2-inch thick rectangle. Using a round cutter about 2-3/4″ in diameter, cut dough circles and transfer them to two of the parchment-lined sheets. Use a 1-1/4″ cutter to cut out the holes. I also used this cutter to cut extra “holes” from the rolled dough left over when the large circles were cut. Place the holes on the third baking sheet. The scraps can also be re-rolled and cut, but try not to do this too many times or too much flour will be incorporated into the dough. Slip the baking sheets into a large plastic bag. Proof for 45 minutes, at which point they can be baked or refrigerated (covered) for 8 – 12 hours. Bake one sheet at a time, just until barley starting to brown. This will take about 10 minutes for the doughnuts, a little less for the holes. If the doughnuts have been refrigerated, they can be baked straight from the refrigerator. Serve immediately, preferably with coffee. I made Heidi’s donuts a while back and adapted the topping also. They are indeed delicious and I wish I had yours with my morning coffee! Thanks for your entry…they make me hungry again! Tartelette and Peabody’s event set me off too. I willpost mine soon. Have seen Heidi’s baked doughnuts and will try the recipe next time I make doughnuts. These look great! I am trying my hand at some donuts today and thought about baking some just to see how they rise. Yours look delicious! These look and sound so good! I’ve never made baked donuts before. Oh wow Susan, baked not fried now that’s the ticket! And I’m a real lover of brown sugar so I’d try that with the chipotle powder! Wild toppings that tug at my heart strings. Beautiful!! wow, these look amazingly delish! i was tempted to partake in the donut marathon myself, but put off by the frying part. and a baked donut sounded just plain wrong. after seeing and reading your try with this, i may just see what happens! I wanted to join the donut event too but wasn’t sure I wanted to fry anything, this looks like a great option! Soo good to look at! Baked, too! I used to buy baked donuts from the local health food store years ago back in the low fat diet craze days. They were so good! I totally forgot about baked donuts until I saw your blog post. I will definately need to try this recipe! Thanks for posting yet another delicious looking baked yummy. My dad always used to talk about and look for raised doughnuts. Thanks for reminding me. Thinking about my dad always makes me smile. I’m going to make some to remember him by. Baked doughnuts! Oh, I must try this. I would have never know it was baked than fried. Aparna, I’m looking forward to seeing your entry! Gretchen Noelle, I didn’t see your doughnuts on your blog so I hope you will show them to us. Deborah, the baked ones are so easy! Tanna, I think chipotle with brown sugar would be great! Katy, no doughnut pan, just a couple of round cutters. Mimi & Brilynn, still almost a week left — plenty of time to get in on the doughnut fest. (Other) Mimi, I don’t know if I would go so far as to call these health food, but they’re definitely less unhealthy than Krispy Kremes. Donna, I think one of the best things about food is the memories it gives us. Jenny, hi, thanks for visiting! Happy Cook, they do look very much like fried, a little chewier though. Yum! I’ve never made donuts (of course I can easily walk to the closest Dunkin Donuts!). Yours look wonderful! Oh yummy! I love the thought of using brown sugar mixture for the topping! I like that you used brown sugar…you don’t see that much. Tracy, no Dunkin Doughnuts here in California. I used to love them when I lived back east though. Kristen, I really liked the brown sugar a lot. I wouldn’t have though of it except I had some leftover sugar mixture from cinnamon rolls. Peabody, thanks to you and Tartelette for hosting this fun event! yummy! love to make this baked donuts one of these days. These turned out so nicely…anything with cinnamon and sugar — especially cardamom and sugar is good by me. They look so perfect! I’m so surprised you’d never made them before (me neither…)with all the bread work you do. Congrats on a excellent turn out! Is it possible to make a baked donut not using sugar, but instead, agave nectar, which I always use in recipes that call for honey. Do you think these be made entirely whole wheat? I really want to try this recipe; however I am having a hard time converting it into cups and my measuring cup does not have grams. Any ideas? These look utterly amazing! And as I have never yet tried making donuts (well, donut holes, yes) I would be less afraid of trying baked than fried. These look so scrumptious and worth any effort! To the above comment, as long as your recipe is right and your oil is the right temp your fried raised glazed won’t absorb any oil; but if you still prefer, you can make any fried donut in the oven even apple fritters. Is it possible to make a baked donut without using sugar, but rather, Agave nectar, which I always use the recipe calls for honey. Do you think they made the whole wheat? 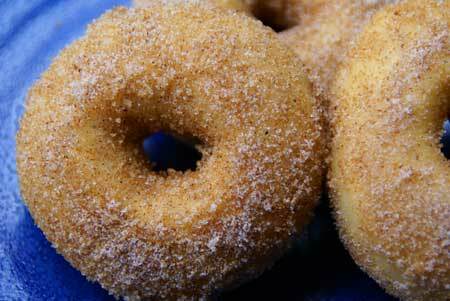 I want to make some doughnuts for Halloween, but dread the frying. Do the Baked Doughnuts come out with a tender bite? I would like to make an apple doughnut but have doubts as to how the moisture from chopped apples would affect the dough. I should also mention that we live at an elevation of about 7000 feet a.s.l. I’ve seldom let that fact modify my baking formulas. Things just take longer to bake, in my experience. Wow….this recipe is great. I will give it a try this weekend. Thanks. I’ve never used milk powder before…what does it do to the dough? In other words, why use it instead of milk? Oh my, these look delicious. Am I brave enough to try to cook them myself? YES!! 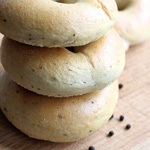 Tried them tonight…turned out like really good cinnamon bagels. Nice and hot and fresh, but not close to a donut. I wonder if the measurements were way off from the conversion (Although I used a conversion calculator), or if the density was to blame on the “white wheat flour.” I will try the inspiration recipe next, sans the wheat flour, or fried version. The brown sugar, sugar, cinnamon topping was great. 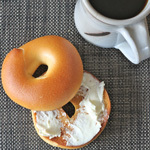 I want to make this recipe, but it’s a little difficult trying to convert from grams to cups, ounces, teaspoons, etc. Any help would be greatly appreciated. I want to make these for the holidays but my daughter is allergic to eggs. Have you ever made anything with soy lecithin? Do you have any advice? I want to do stuffed doughnuts too with orange & ricotta. We are going to do a doughnut bar with all kinds of toppings for Christmas. Can’t wait!! Krista, I have never used soy lecithin in place of egg. I think your best bet is to search for a recipe that was specifically developed to be egg-free. Good luck! 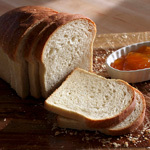 I’m seeing the whole negative effects of gluten debate more and more and I’m wondering is there a gluten free version? Also there is that new doco on Netflix about Food and I think it talks about a slower fermentation over days from wild yeast actually breaking down gluten and making nutrients much more bio-available. Is that right?